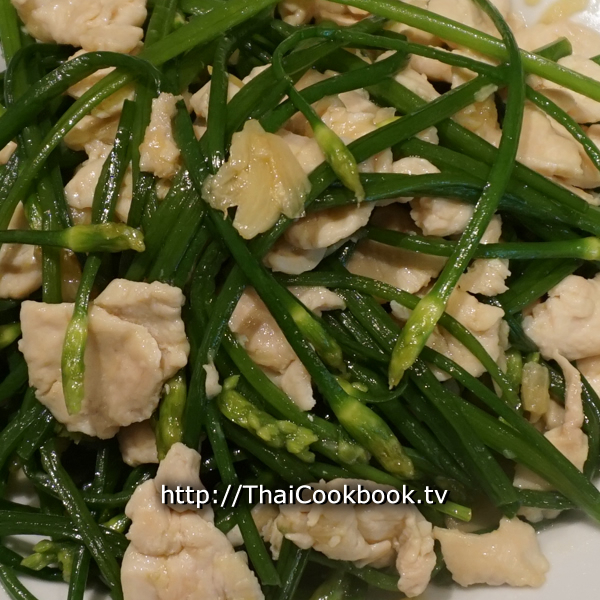 Whether you need another delicious dish to round out that Thai food dinner you're planning, or just want to have a nice one-dish meal for lunch, nothing beats the bright color and authentic Thailand flavor of this dish made with chicken and flowering garlic chives. It's simple to make and has just a few ingredients. 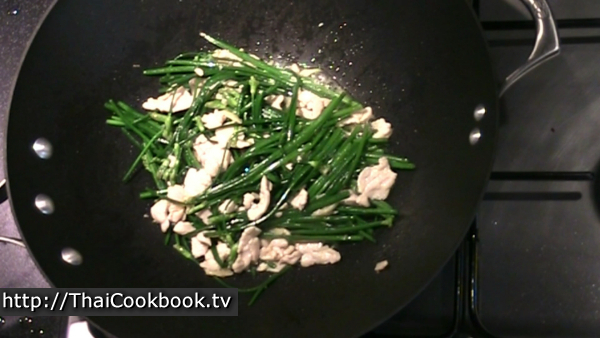 We start by slicing boneless and skinless chicken breast into wafer thin slices and stir fry it together with garlic and long, bright green chives. The result is chicken that is delicate and juicy, wrapped in slightly wilted, yet still crisp chives. As a main dish it goes well with other foods and brightens the overall meal. As a one-dish meal meal with rice it is very satisfying, but I like to skip the rice and just eat it alone, making it like a nice chicken and chive salad. 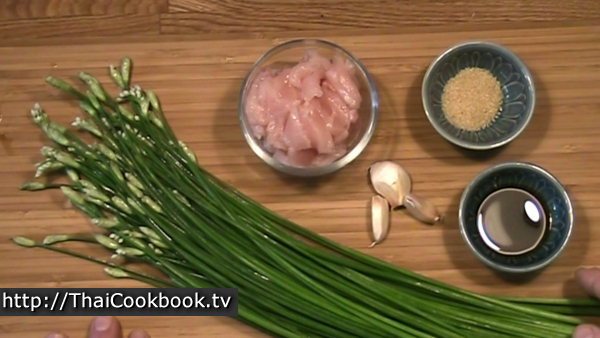 What's in our Garlic Chives with Sliced Chicken. 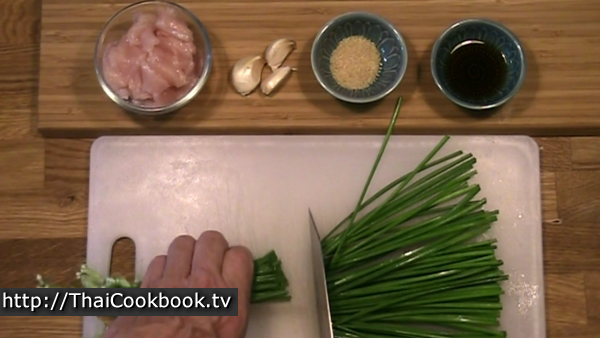 How we make our Garlic Chives with Sliced Chicken. 1) Fry the crushed garlic in a little oil until fragrant, about 30 seconds. 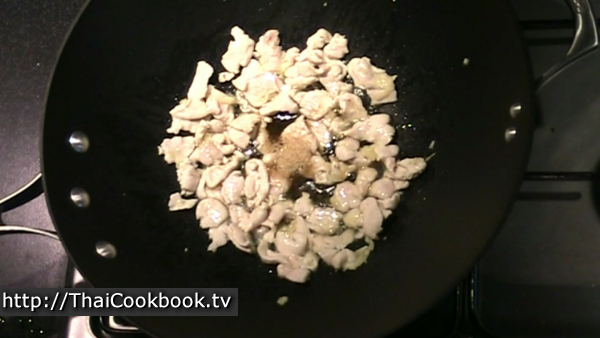 2) Add the chicken meat and stir fry with the oil and garlic until nearly cooked through. 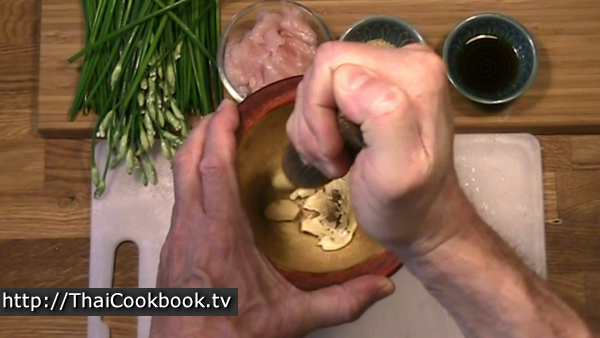 3) Add the fish sauce and sugar and stir into the chicken until the sugar melts. 4) Toss in the chives and add a little water. 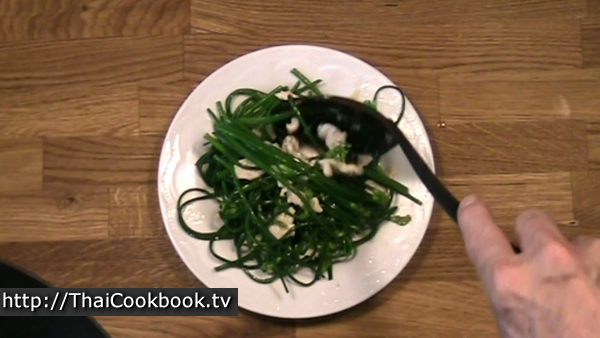 Stir and fry until the chives are wilted. Serve immediately. If using chicken or pork, slice it very thin across the grain of the meat so it will be soft when cooked. If using shrimp, remove the heads, peel the shell, then devein and clean them very well. Cut the chives so they are about 4 - 5 inches (10 cm) long. Add one tablespoon of vegetable oil to a hot wok or frying pan. Add the garlic and let it fry for about 30 seconds. Add the chicken meat and fry in the garlic and oil for about 2 - 3 minutes, or until nearly cooked all the way. Add the fish sauce and sugar. Fry until the sugar melts completely into the fish sauce and oil, making a nice brown sauce. Add the garlic chives and 1 or 2 tablespoon of water. 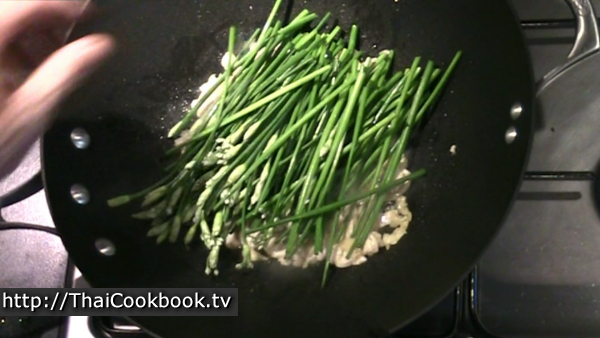 Stir and toss the chives into the meat and sauce until they begin to wilt. Turn off the heat as soon as the chives are softened just a little, but still crisp and bright green. Serve on a small plate. Arrange the meat and chives so it all looks nice. Can also be served next to a portion of rice for a one-dish meal.